In Soviet times Karakol was named Prezhevalsk, after the Russian explorer who made several journeys into Central Asia and nearly reached the gates of Lhasa in Tibet, before contracting an illness - TB (Tuberculosis) or Typhoid, there seems to be some confusion - and settled in the area over looking the Lake to spend his remaining days. There is a museum dedicated to him on the site of the house which he built. Originally named Karakol, and in 1886 renamed Prezhervalsk; Lenin ordered the return of its original name in 1926 only to have Stalin rename it Prezhevalsk again in 1935 - Finally in 1991 it was renamed Karakol once more. The Holy Trinity Cathedral is a fine example of a Russian Orthodox Church, which served as a dance hall under the Soviets, and has been renovated. There is also a Dungan (Chinese) mosque in the town that actually predates the Church. There is a Regional Museum with a fine collection of musical instruments and the Sunday Animal Market, which attracts a large number of locals and travelers. With its large number of colonial style buildings ("chocolate box cottages"), shady, poplar lined streets, lively market, the oldest hippodrome in Central Asia, and overlooked by the Terksey ("Shady") Ala-Too Mountains, it can give the impression of a nineteenth-century Russian village. However, Karakol is perhaps best known these days as a center for trekking, with a large number of well established routes in the valleys nearby. Near the city are Djety Orguz health resort and "Seven Bulls" rock formation, and the Valley of Flowers. Many trekkers visit the Ak-Suu (Tepliyekluchenki), Altyn Arashan and Karakol valleys. Karakol is also the last city on the way to Enchilek and the mountains Khan Tengriand Peak Pobeda. 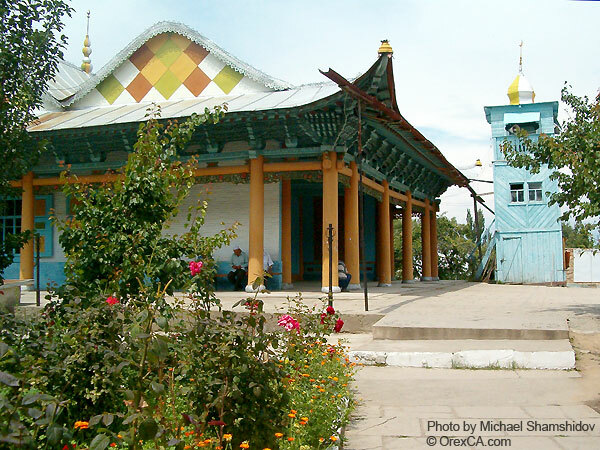 There are a number of small guesthouses and hotels in Karakol and several local companies can offer tours and services in and around Karakol. Ask us for details!